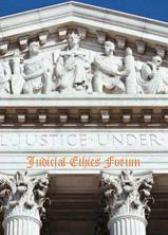 Cindy Gray and the Center for Judicial Ethics have kindly posted a recent edition of the Judicial Conduct Reporter. Click here to view the edition (Winter 2015). It is an informative read, including a summary of the 104 instances of public judicial discipline in 2014, a list of top judicial ethics stories in 2014, and a flyer for the 24th National College on Judicial Conduct and Ethics (which will be held in Chicago on October 28-30, 2015). In 2008, the Judicial Conference of the United States – the administrative policy-making body of the federal judiciary – approved a revised set of rules for handling complaints of misconduct or disability on the part of federal judges. Moving away from the decentralizing approach of the pre-2008 Illustrative Rules, the new rules were made binding on all of the federal judicial circuits. On September 2, 2014, the Conference’s Committee on Judicial Conduct and Disability (Conduct Committee) issued a set of draft amendments to the Rules. The announcement invited comments on the proposed amendments. This statement was submitted in response to that invitation. The statement is in four parts. Part I provides some background. Part II discusses the policy changes proposed by the Committee. Part III addresses the special problems raised by “high-visibility” complaints. Part IV suggests some additional modest revisions in the Rules and flags issues that warrant the Committee’s attention in the future. Most of the amendments in the published draft involve clarification or emphasis. But I have identified six revisions that do reflect changes of policy from the 2008 Rules. Five of the six reflect sound policy; they will serve to enhance transparency and strengthen procedural regularity. However, one proposed revision – an amendment that would allow tie votes in the Conduct Committee on petitions for review – is unwise. I urge the Committee to reconsider it. Part IV addresses a variety of issues raised by the proposed draft and the Rules as originally adopted. These include: the chief judge’s obligation to “identify” a complaint based on public reports suggesting that a judge may have engaged in misconduct; judicial council authority to impose sanctions on complainants who abuse the process; disqualification of judges from proceedings under the 1980 Act; and making the Rules more user-friendly. The most detailed discussion involves two issues raised by the misconduct complaint against former District Judge Richard Cebull of Montana: judicial-council authority to conclude a proceeding and disclosure of judicial-council orders that have been vacated or modified. One who is convinced that a judge wrongly decided a case may sometimes be tempted to accuse the judge of bias, referring to unconscious social-group stereotypes and/or cognitive biases that fall under the rubric of “implicit biases.” The rhetoric is problematic, however, for various reasons. One is that the term “bias” in this context may be misunderstood to mean something different and unintended – either a disqualifying bias under judicial conduct rules or a conscious prejudice. Another is that, even if the intended meaning is clear, a judge’s implicit biases cannot fairly be inferred from a single wrong decision. To illustrate the problem with accusing judges of bias, given the term’s various meanings, the article focuses on recent federal litigation over NYC police stop-and-frisk policy in which (1) the district judge found “implicit bias” in police practices based on accumulated evidence and expert analysis, (2) the Second Circuit found that the district judge engaged in disqualifying judicial bias because of her comments in a prior related lawsuit and in the media, and (3) critics accused the Second Circuit of bias in making decisions that were hard to justify on either procedural or substantive grounds. The article concludes that, on balance, it is better to resist the temptation to import “implicit bias” rhetoric into critiques of individual judicial decisions. Bruce Green, Legal Discourse and Racial Justice: The Urge to Cry “Bias!”, 28 Geo. J. Legal Ethics 177 (2015).